''Lagoon Edge'' is the name my grandmother gave this beautiful home, which was one of the original houses in the neighborhood. The house came down to me a few years ago, and I undertook a major renovation, inside and out. The goal was to tastefully preserve the character of the original house while updating it with a chic look and top-quality appliances and amenities. In its new incarnation, this well-appointed house retains its classic charm while offering modern comforts and elegant touches throughout. The house has been loved by my family for generations, and I have many fond memories from summers growing up. Now that Lagoon Edge has been passed down to me, I am excited to share this special place with others. Walk out of the kitchen for dining and water views on the expansive deck, and stroll down to the Lagoon for a dip or a relaxing glass of wine at sunset. 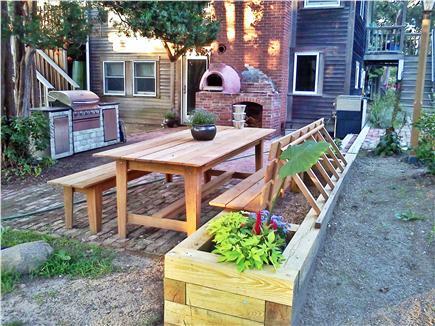 Enjoy the outdoor fireplace and wood-fired pizza oven, and cooking in the outdoor kitchen on the brick patio. The stone walls, patios and gardens give the property a spacious and inviting feeling and offer plenty of outdoor living space; including a lovely seating area among the flowers outside the master bedroom. The gardens provide a variety of flowers and delectable herbs, vegetables and berries for your enjoyment. 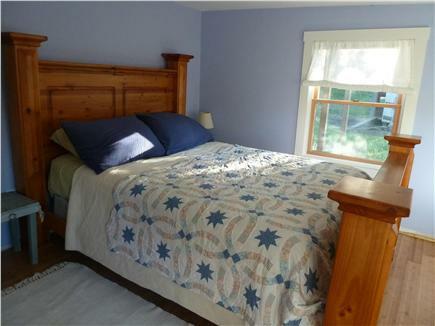 In the main house there are 4 bedrooms (2 queen, 1 double, 1 pull-out double twin) all with new beds. The 2 bathrooms are beautifully tiled, with touches of stone and glass, and there is an outdoor shower to complete your vineyard experience. The guest cabin adjacent to the house provides another queen bed and private bath, making sleeping space available for 10. If you wish to use the futon in the loft and living room sleep sofa, the house accommodates up to 14. The home is equipped with top-notch cooking equipment in the chef's kitchen, and a collection of cookbooks is at hand to help you prepare your catch, should you be so inclined. The library also includes plenty of summer reading and nature guides and books about the people and history of the Vineyard, as well as a selection of games for rainy days. The first floor wet bar is another great feature, whether you are entertaining or just enjoying yourselves. 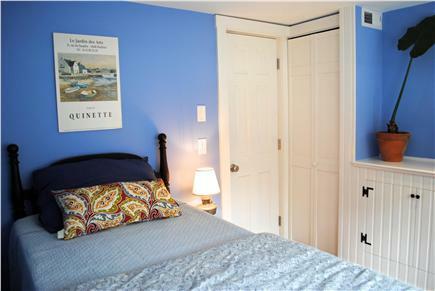 The house is fully equipped with wi-fi, and there are bluetooth accessible sound systems upstairs and down. The den downstairs has a 52'' flatscreen TV with premium cable channels and HDMI access for viewing from your devices. There is also a whole-house HEPA filter that removes allergens while circulating air-conditioned air throughout the home. Located at 11 Shore Drive on the corner of Lagoon Rd. and Newton Rd. 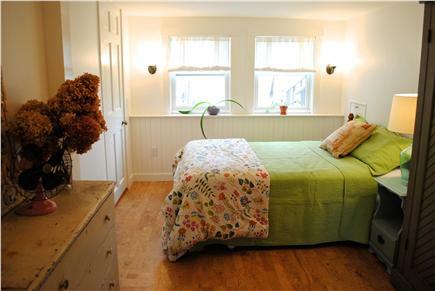 in Oak Bluffs, the house is both somewhat tucked away, and very conveniently located. The neighborhood is great for walking and bicycling and Oak Bluffs town center is just a 5 minute drive, or a 10 minute bike ride away. As a kid, our little beach on the Lagoon was one of my favorite places. Through the years I loved floating in the sun and playing with the hermit crabs and periwinkles in the pond. I've also enjoyed learning to row and sail, paddling canoes and kayaks, snorkeling, water-skiing, digging clams and fishing in the Lagoon. I also have a mooring available by request. Call or email if you would like any more information or to make a reservation. I look forward to welcoming you. All 10 of us loved this house. Everyone had enough space to unwind. 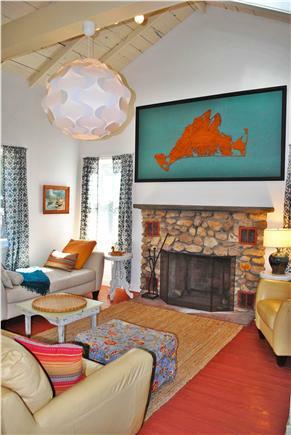 The house was decorated tastefully and comfortable. 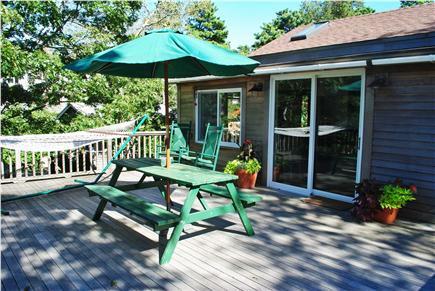 The big deck is a wonderful gathering spot. Starting the day having coffee and ending the day with cocktails. Just about every night we headed to the lagoon beach to enjoy the sunset. The grill worked very well and the kitchen served us perfectly. All slept well each night and beds are comfortable. It is a nice piece of property with a garden by the driveway. Jason is such a pleasure to work with. Easy to talk to and helpful advice when asked. We have been looking for “ the house “ to return to each year. The search is over, and we can’t wait to come back next year. Lagoon Edge is a magical place. Our family had an incredible Martha's Vineyard vacation. The view from the deck of the lagoon was fantastic for morning coffee and dinners. Adventuring all of MV during the day and then heading back to the peace and tranquility of the lagoon was a dream come true. We found this house very last minute on Craigslist and then came to this site and saw the pictures and they simply do not do any justice for the house. 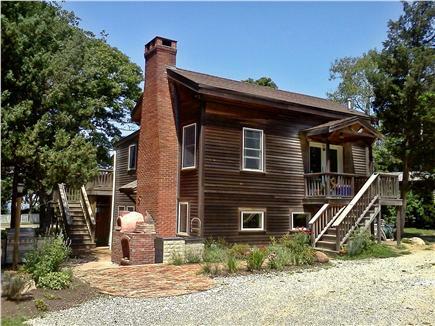 In person, this house is beautiful with rustic charm. It was just what we needed and then some with the 5th hideaway bedroom. There was plenty of space for my family and friends. The first couple of days it rained and we stayed indoors playing games and having fun in the large family room and other days we took leisure walks to the very private and nice lagoon. My husband and friends actually learned how to fish and had a blast. The inkwell is a 5-7 min car ride or a 15-20 minute walk. This is a great location and close enough to everything. This was the first time that we went away for a week with my MIL, grandchildren and my sister-law. The house has 5 bedrooms including the loft, which my 15 year old nephew loved. We had an additional bedroom and bath with the cabin that was used for a total of 6 bedrooms. Our family LOVED it! My god-daughter told Jason that she wanted to move in forever. 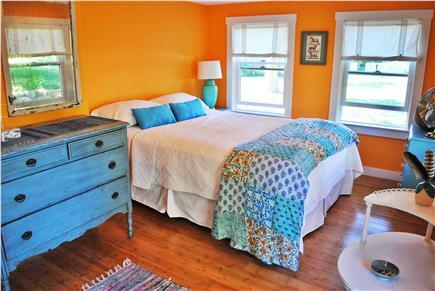 It is beautifully furnished, yet inviting so you feel comfortable enough to relax. The yard space and patio were perfect for mid day bbq lunches and spending time. The children enjoyed the private beach and the proximity to the center of the city to ride their bikes into town. The garden was also a favorite! Every amenity was considered, from board games, to kitchen supplies. We will miss the hammocks! Our first time on Martha’s Vineyard was 1978 and we camped in Webb’s Campground. We moved from camping to a 1906 cottage three blocks from Lagoon Edge. Our kids have fond memories of spending time on the Vineyard and this trip was about making new memories with their kids. Lagoon Edge is a perfect location – the area is quiet, the lawn gives lots of room for energized kids, the Lagoon is footsteps away for an afternoon swim or scooping up little crabs and fish or kayaking. We rented a kayak for the week and carried it across each morning and left it on property that belongs to Lagoon Edge. South Beach and State Beach are a short drive away and because summer is a busy time on the Vineyard, we would go to the beach in the morning and be home by 1 PM for lunch. The Lagoon is a perfect beach place for the afternoon. Oak Bluffs and Vineyard Haven are very close and it’s easy to pop into town and spend an hour and, of course, get ice cream. The house is designed and decorated with a lot of thought put into its being a place for people to gather – large and cozy with lots of room for our family of ten. 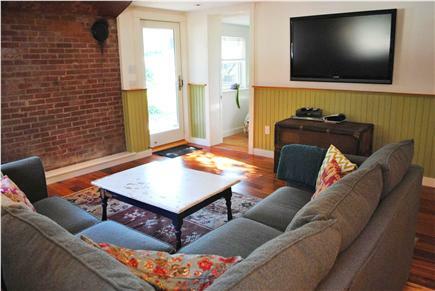 There are two large living room areas with one for reading and one for TV watching. We ate out on the deck or down next to the outdoor fireplace every night. The kids cooked marshmallows one evening in the outdoor fireplace. The two hammocks got a real workout! Lagoon Heights has not changed much, so the old memories are still in place and we will now have the addition of the grandkids saying, “Remember when---,” about Lagoon Edge and the Vineyard. 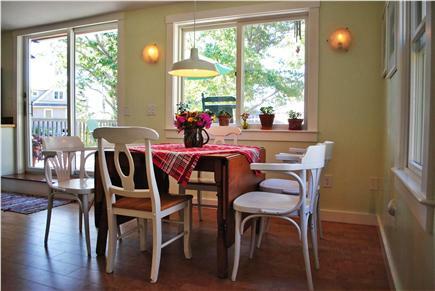 As fairly seasoned travelers, our family of 8 has stayed in lots of private homes over the years, so calling Jason's lovely Lagoon Pond home in Oak Bluffs our "favorite" is saying a lot! 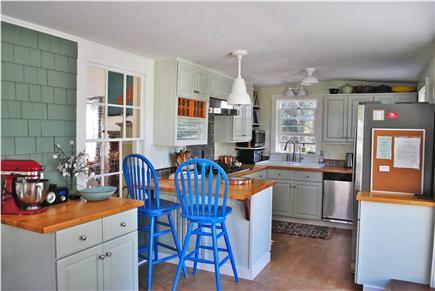 Not only is the location of this home convenient to the three major towns, it is also ideally positioned on the beautiful Lagoon Pond, with a private beach where we enjoyed swimming, clamming and glorious sunsets. The house itself is newly remodeled and has a charming old, yet new feeling - with wonderful decorating touches and very thoughtful additions to make any family feel comfortable and pampered. A large deck, two hammocks, several picnic tables, an outdoor kitchen and brick pizza oven (more on this later), an outdoor shower, a garden that renters are welcome to share, wood for fires, books, games... plus an adjacent cabin for whichever family member(s) desires the most privacy! Beautiful, immaculate, charming - our family's favorite vacation!! !